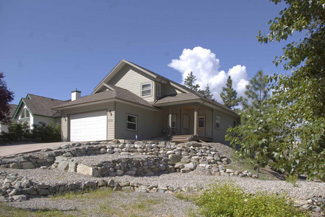 4 bedrooms and a den on over half an acre - this is a great property for a family! Located in popular Heritage Hills, the 4-year-old home has a large open floorplan with a cathedral ceiling in the living room, massive dining room and a partially covered deck that's designed for entertaining. The modern kitchen features a sit-up eating bar and there's a large separate pantry. The big master bedroom has a 'best-of-all-worlds' enuite - a soaker tub with a view at one end and a large walk-in shower at the other - plus its own private deck. The lofted computer area looks down into the living room. Loads of parking for an RV and boat. Large crawlspace is accessed from the backyard - perfect for storage.